and that it seriously endangers the eternal destinies of millions of people. There are three "catches" in use of this promise. First, one must be a Christian as that is the meaning of the "we." Second, the thing asked for, must be within the will of God. Third, if it is a question that is asked, one must accept and embrace God's answer, in advance. One cannot say, "God tell me your answer, and then I will see if I want to accept it or not." God looks on the heart. Many professional religious or political leaders are disqualified from this promise, because they are already constrained to hold certain viewpoints -- they are not at liberty to accept God's answer. Also, wives, biblically, are constrained to their husband's views as he is their "head." Again, God really has made good for me, this great promise many times. My views, in these instances, are from God. Several times I’ve vigorously discussed Mormonism with persons of that persuasion. I quickly realized that to read and evaluate the great mass of material pro and con would take me the rest of my life. 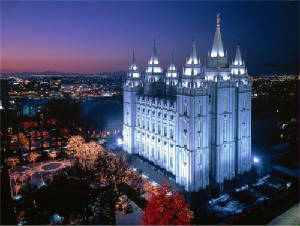 So I simply chose to sincerely pray and ask Almighty God about the Mormon or LDS religion. And this is the confidence that we have in him, that, if we ask any thing according to his will, he hears us; and if we know that he hears us, whatever we ask, we know that we have the petitions that we desired of him. I carefully fulfilled the prerequisites for God to honor and fulfill this great promise and He made good on His promise and gave me the answer to the question. I do not mean to be unfair or harsh toward anybody. But, God has made it absolutely clear to me that Mormonism is a false religion and that it seriously endangers the eternal destinies of millions of people. They need to be warned. My purpose in this pamphlet is to clearly, concisely warn all who will listen that Mormonism is definitely not Biblical Christianity, and it can not save anyone from God's eternal judgment. Only personally believing on and embracing the Lord Jesus Christ will get a person complete atonement for sins and everlasting life! There are three qualifications in using this promise. First, the context shows the "we” means real Christians. Since I have personally taken that Jesus Christ of the Bible as MY Lord and Savior, I do qualify here. Second, praying "according to HIS will” means the objective one is seeking must be in God's will. Third, it also means that one must be willing, in advance, to accept God's answer, like it or not. One cannot say, "God give me your answer, and then I'll see if I want to accept it or not." In my prayer I said, "God, that Mormon found his Bible verses as fast as I found mine; and for every fancy intellectual argument I had, he had one just as fancy." I said, "God I'm willing to become a Mormon if that is really your will. I ask you to please show me your will!" The Bible tells us that it is very definitely God's will I know how to properly serve and worship Him. Thus, I’m sure I prayed "according to his will", thereby qualifying myself for his promise in 1 John 5:14, 15. I was very excited as God begin to faithfully keep his part of this bargain in giving me "the petition that I desired of Him." In the past 20 years God has given me some dozen solid Bible answers to my petition. He continues to add more. Not mere human mental ideas mind you, nor feelings, but always as the Holy Spirit has guided me to, and through, the passages of the Bible. Jesus says, "The law and the prophets were until John: since that time the kingdom of God is preached, and every man pressed into it." "God, who at sundry times and in divers manners spoke in time past unto the fathers by the prophets, Hath in these last days spoken unto us by his Son, whom he hath appointed heir of all things, by whom also he made the worlds"
And they caught him, and cast him out of the vineyard, and slew him. When the lord therefore of the vineyard cometh, what will he do unto those husbandmen? Note carefully the sequence of events in this prophetic parable. Following the murder of the "heir," the landlord does NOT send another long line of his servants (prophets,) but rather he personally comes himself in final judgment. And hath put all things under his feet, and gave him to be the head over all things to the church, Which is his body, the fullness of him that fills all in all. LDS claim the church died out, and had to be restarted by Joseph Smith. The TRUE Church is an ORGANISM, NOT AN ORGANIZATION. The true Church is all Christians indwelt personally by Jesus. Else what shall they do who are baptized for the dead, if the dead rise not at all? Why are they, then, baptized for the dead? The individual cells of the human body may only live a few years before they die and must be replaced with new ones. The body itself, however, does continue living. A careful study of the context of 1 Corinthians chapter 15 compels us to interpret verse twenty nine in this manner. New believers are baptized to replace dead cells in Christ's body, but the body, of course, does not die. The Gates of Hell can’t stop it. Matthew 16:18: Upon this rock I will build my church, and the gates of hell shall not prevail against it. The Book of Revelation is probably the most extensive and detailed prophesy in the entire Bible concerning future events. If the Church failed and had to be restarted should we not see that foretold in this book? If a great period of "latter day saints" lay ahead for the true Church, should it not be revealed in the Book of Revelation? But, I humbly submit that we find no such scenarios in this book. The Church is in view through chapter three. Then, at the beginning of chapter 4, John, representative of the Church, is caught up into heaven. God's ancient program with Israel is resumed on earth. The Church is not in view again until chapter 19, when believers return with Jesus Christ to earth to crush his foes and establish His earthly kingdom for 1000 years. The Book of Revelation is so obviously the splendid crown, the supreme, elegant, final conclusion, the grand finale to the written Word of God. All the great themes that arise and magnificently weave their way through the pages of the Bible find their ultimate fulfillment, satisfaction, and lovely harmonious conclusion in this great Book of Revelation. But what about the book of Mormon and the other LDS books? I believe that God has brought thoughts like these to my mind. Suppose you went to a great Broadway play, complete with the very best actors. The play reaches its great climax and moves on to its excellent conclusion. The curtain falls after the final scene, the house lights come on. People put on their coats, and move toward the doors. When suddenly the play writer rushes onto the stage yelling, "Wait! Wait! I just thought up two more acts to this play. Come and sit down again." Pretty ridiculous, right! That is what God showed me about the book of Mormon. The Book of Revelation is so obviously the most exquisitely beautiful and satisfyingly complete conclusion to entire Holy Bible, and to God's program, that it is totally incredible to even think that God had to jump up on stage after the final curtain, yelling, "Wait! Wait!, I have three more books I just dreamed up. An extremely sober warning indeed! Bible prophesies are a primary way God authenticates His Word, the Bible. As time goes on, God's great plan unfolds, and prophesy after prophesy turns into current news before our eyes. This proves the same Creator God wrote the Bible. NO other book has this unique authentication system. The three LDS Books have NO such track record to prove their authenticity as portions of God's Word. Jesus said unto him, Have I been so long time with you, and yet hast thou not known me, Philip? he that hath seen me hath seen the Father; and how sayest thou then, Show us the Father? Believest thou not that I am in the Father, and the Father in me? the words that I speak unto you I speak not of myself: but the Father that dwells in me, he doeth the works. How could the Almighty Father be IN the Son if the Son is not infinite? How could anyone SEE the Father in the person of Jesus, if Jesus is not infinite too? How could the perfect equality of God the Father and the Son be better described? The Jewish leaders clearly understood, that in claiming to be the Son of God, Jesus was indeed claiming TO BE GOD. He IS truly Almighty God in his own right, NOT the EVOLVED GOD MORMONISM describes him to be! Dear Reader, it is certainly possible to “interpret” any Bible passage, to attempt to justify the views or life styles one may prefer. I did not do this. I gave God the choice. I carefully met the prerequisites to his promise in 1 John 5:14, 15. God carefully fulfilled his promise. I did not search for the Bible verses I have sighted, but rather the Holy Spirit brought them to my mind as I meditated on this important question. 1. All persons are sinners before God, as measured against GOD’S holiness. See Book of Romans chapters 1-9. 2. Jesus Christ is God’s only Savior of the world - Acts 4:12. 3. You must personally come to, choose, and receive Jesus Christ as your own Savior. Read the Gospel Book of John. 4. Dying without Jesus Christ as your very own personal Savior, means eternal punishment in hell. Carefully study the New Testament of the Bible. John is good place to start. Realize, it isn't just your eternal destiny that you should be concerned with, you must think also of your family and friends who are so greatly influenced by your life. What choice will they make because of you? You simply can't allow them to face eternity without Jesus. Investigate all the facts! You have nothing of any lasting value to lose by personally seeking ONLY the Almighty God of the Bible. It’s not just the downside risk, but missing out on eternity with this incomparable God. The man expressed saving faith and made his personal appeal to Jesus. This is what each person must do! Darwin’s Evolution idea has run-a-muck, intimidating Bible believers for 100+ years, but the tide has changed, and big time. Our high tech world bristles with millions of complex coded information systems. We KNOW these NEVER arise by accident but only by brilliant, rigorous engineering. Our same high tech ability reveals an estimated 10-100 millions species of organisms on earth with most genetic codes in the billions of letters. Evolution is thus PROVED to be a fairy-tale! Immense complexity everywhere points plainly, absolutely, to THE Almighty Creator God. Ubiquitous mind-boggling complexity does not come from cosmic accidents. Carefully prepare to meet God! Get atonement from Jesus! See the book of John chapters 1 through 10.